"A man curses because he doesn't have the words to say what's on his mind. " Malcolm X is an invigorating, informative, and altogether magnificent film that chronicles the life of the slain civil rights leader from his childhood in Nebraska to his assassination at the Audubon Ballroom in February of 1965. Though a tad long—it clocks in at nearly three and a half hours—the film is a wondrous trip through several decades and various stages of Malcolm's life, through the good and the bad. Directed by Spike Lee, the film became a lightning rod of controversy upon its release in 1992 as many derided it as "hero worship", and, after the marketing machine had driven it so far into the American consciousness that it was impossible to go anywhere without hearing it discussed or seeing the memorable "X" everywhere you looked. Now, after nearly thirteen years, the film is somewhat freed of this controversy and hype, and can be seen for what it is: a powerful biography of a man who simply wanted the best for the human race. Malcolm X opens in Boston during WWII, and after a wonderful establishing shot featuring a bustling city street we are bounced back and forth between Malcolm's (then, Malcolm Little) life in Boston with his friend Shorty (Lee) and his childhood in Omaha, Nebraska. We learn of his struggle from an early age after his father was beaten and murdered, presumably by members of the Ku Klux Klan, and his family home burned to the ground. In Boston, Malcolm goes to work for West Indian Archie (Lindo), a crook who introduces the young man to numbers running, drugs, and burglary. Soon Malcolm is arrested and, in prison, becomes the picture of a man who has contempt for anyone and everything and it lands him in isolation for much of his stay. But when Malcolm meets a fellow inmate named Baines (Hall), he soon becomes enamored with the teachings of Elijah Muhammad, becoming a member of the nation of Islam. As Muhammad's prominent disciple, Malcolm becomes a well-known leader of the movement—until he becomes disillusioned by those he once respected and splits from the organization. Along the way, he marries Betty Shabazz (Bassett) and weathers death threats, constant surveillance from the FBI, and makes the hejira to Mecca, shortly before his death. It is easy to see from the start that Lee truly cares about his subject matter and he has given the film an epic yet intimate feel. Working from a relatively small budget for this type of project ($30 million), he succeeds admirably. Cinematographer Ernest Dickerson gives the film a distinctive look—the opening scenes in Boston showcase a nostalgic sense while the prison sequences are presented in steely blues and grays. The large scope does get away from Lee in an overlong big band sequence early in, but it is a small flaw in a grand and stunning film. Washington offers an effortless performance that is impressive in its range from Malcolm's days as a small-time crook, dancing and entertaining in zoot suits with Shorty, to offering smoldering speeches in Harlem. You instantly believe Washington in the role as he always carries an intensity that is obvious beneath the surface—it is a truly incredible piece of work. 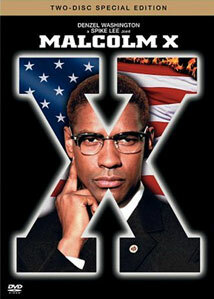 For Spike Lee, Malcolm X stands as the best moment in an illustrious career. Lee admits in the wealth of bonus material on this DVD that he was cautious from the outset, frequently telling himself "not to mess Malcolm up." As with any great labor of love, Lee does become a bit over-enamored with his tale, but overall does a terrific job, presenting a story that gains momentum and enthralls with the powerful life of its protagonist. Robbed of any type of major award recognition, the film gains power and meaning with each passing year. This is easily one the best screen biographies ever made and it stands as a crowning achievement for all involved. Image Transfer Review: The 1.85:1 anamorphic widescreen transfer for Malcolm X is done well with terrific colors that are vibrant and rich and display only a minimal amount of bleeding. The transfer offers a very rich film-like look throughout and there are no instances of edge enhancement evident. Audio Transfer Review: The Dolby Digital 5.1 mix is adequate with deep and clear dialogue and some nice activity in the surround channels. The rear speakers do a nice job of establishing ambient sounds and offer the musical score in a rich and full manner. Extras Review: This special edition of Malclom X spreads the film as well as the special features across two discs. The first extra is a commentary by director Spike Lee, cinematographer Ernest Dickerson, editor Barry Brown, and costume designer Ruth Carter. The track is extremely informative as Lee talks about the origins of the project and the struggle to get the film completed, including donations from the likes of Oprah Winfrey, Michael Jordan, and Bill Cosby. Dickerson offers tidbits on why he chose certain visual styles and how he achieved the looks he wanted for certain scenes. By Any Means Necessary: The Making of Malcolm X features interviews with cast and crew as well as a further detailed discussion about getting the film off the ground. (One interesting note is that Norman Jewison was originally slated to direct the film.) Rounding out Disc 1 are several deleted scenes, with an introduction by Lee, rightfully excised save for a very nice moment between Washington and Bassett as Malcolm and Betty flirt while he tells her about the Muslim culture. While each of these features are impressive, they're topped by Malcolm X, the Oscar-nominated documentary that showcases Malcolm's life from start to finish. Taken from interviews and speeches, the majority of the documentary offers the man in his own words with helpful narration by James Early Jones. This is a fascinating look at this important figure, as it offers insight beyond what is seen in Lee's film. This is a wonderful addition to the already terrific feature film. Incendiary and emotional, Malcolm X is truly one of the best films of the 1990s and is required viewing for anyone who appreciates fine filmmaking as well as stories full of power and meaning. Highly Recommended.